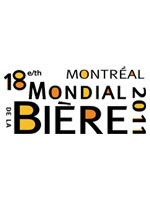 The 18th edition of the Mondial de la bière, the most important festival of international beers in America, will be held at Place Bonaventure from June 8 to 12. Featured this year, beers from the United Kingdom, one of the most eminent brewing influences of the brewing world! 5 days of festival where Montreal becomes the capital of beer!! Not to miss: Biertrotters' Beach, Silent Dance Esplanade and Dj, Mini Disc golf tournament, Unplugged Music Competition and the very popular Beer and Cheese Workshops! WARNING: Only the Mondial de la bière glass (from 1994 to 2011) and 5 ounce and under plastic cups will be tolerated for the service of beer.